On the basis of Sean’s comment, about using a regression to look at how phoneme inventory size improved as geographic spread was incorporated along with population size, I decided to look at the stats a bit more closely (original post is here). It’s fairly easy to perform multiple regression in R, which, in the case of my data, resulted in highly significant results (p<0.001) for the intercept, area and population (residual standard error = 9.633 on 393 degrees of freedom; adjusted R-Squared = 0.1084). I then plotted all the combinations as scatterplots for each pair of variables. As you can see below, this is fairly useful as a quick summary but it is also messy and confusing. Another problem is that the pairs plot is on the original data and not the linear model. It’s long since been established that demography drives evolutionary processes (see Hawks, 2008 for a good overview). Similar attempts are also being made to describe cultural (Shennan, 2000; Henrich, 2004; Richerson & Boyd, 2009) and linguistic (Nettle, 1999a; Wichmann & Homan, 2009; Vogt, 2009) processes by considering the effects of population size and other demographic variables. Even though these ideas are hardly new, until recently, there was a ceiling as to the amount of resources one person could draw upon. In linguistics, this paucity of data is being remedied through the implementation of large-scale projects, such as WALS, Ethnologue and UPSID, that bring together a vast body of linguistic fieldwork from around the world. Providing a solid direction for how this might be utilised is a recent study by Lupyan & Dale (2010). Here, the authors compare the structural properties of more than 2000 languages with three demographic variables: a language’s speaker population, its geographic spread and the number of linguistic neighbours. The salient point being that certain differences in structural features correspond to the underlying demographic conditions. With that said, a few months ago I found myself wondering about a particular feature, the phoneme inventory size, and its potential relationship to underlying demographic conditions of a speech community. What piqued my interest was that two languages I retain a passing interest in, Kayardild and Pirahã, both contain small phonological inventories and have small speaker communities. The question being: is their a correlation between the population size of a language and its number of phonemes? Despite work suggesting at such a relationship (e.g. Trudgill, 2004), there is little in the way of empirical evidence to support such claims. Hay & Bauer (2007) perhaps represent the most comprehensive attempt at an investigation: reporting a statistical correlation between the number of speakers of a language and its phoneme inventory size. That vowel inventory and consonant inventory are both correlated with population size is quite remarkable. This is especially so because consonant inventory and vowel inventory do not correlate with one another at all in this data-set (rho=.01, p=.86). Maddieson (2005) also reports that there is no correlation between vowel and consonant inventory size in his sample of 559 languages. Despite the fact that there is no link between vowel inventory and consonant inventory size, both are significantly correlated with the size of the population of speakers. Using their paper as a springboard, I decided to look at how other demographic factors might influence the size of the phoneme inventory, namely: population density and the degree of social interconnectedness. In a series of posts, I’ve been discussing constraints on the evolution of colour terms. Here, I discuss the role of drift and also argue that universal patterns are not necessarily good evidence for innate constraints. For the full dissertation and references, go here. An important point which has not been highlighted in the literature is the drift introduced by cultural transmission. Perceptual systems are noisy, and change over lifetimes. Therefore, systems of categorising these perceptions may drift over time. However, if concepts are shared, this drift is influenced by more than one system. This may cause a different kind of drift from a stand-alone system for self-thought. Communication has an additional semantic bottleneck which self-though does not have. Using language for self thought, if you don’t know a label, you can make one up. However, for communication, this won’t work. For example, in models of cultural transmission (e.g., Steels & Belpaeme, 2005) agents do create new labels but, importantly, accept the speaker’s label when available. That is, communicative systems are more flexible than systems for self-thought (communicators must be more willing to change their minds), and so are more subject to drift. The drift allows the system to move around the possible space of coding efficiency and object categorisation efficiency. Peaks in these landscapes will attract the drift, hence environmental and perceptual constraints being projected into language. Although systems of colour categorisation for self-thought may be more efficient if they were constrained by the environment, shared cultural systems are more likely to reflect constraints in the environment because they are more flexible. That is, perceptual constraints have projected themselves into language because of a communicative pressure, rather than a perceptual or environmental pressure. I suggest that this drift, together with an ability for categories to warp perceptual spaces, would mean that individuals converge on a shared perceptual system. If comprehension involves the activation of perceptual representations, then communication involves individuals reaching similar perceptual representations or, in a perfect world, activation of the same neural substrates. Therefore, a population with a shared perceptual system would be able to communicate much more effectively. In this sense, Embodied systems improve communicative success, whereas the same effect is not necessarily true of Symbolist systems. Furthermore, this drift means that populations can still converge on similar solutions, without having to assume that Universal biases are the main driving force. It has been argued that the similarities in colour categorisation between cultures contradicts Relativism, which would predict a large variation in colour categorisation between cultures (e.g., Belpaeme & Bleys, 2005). I argue that this inference is not necessarily valid. This series of posts has shown that a wide range of factors constrain the categorisation of colour, including the physiology of perception, the environment and cultural transmission. Why is there evidence for Colour Terms being adapted to so many domains? This study considered the idea that categorisation acquired by individuals can feed back into perception and itself become a constraint both on the development of categorisation, the environment and genetic inheritance. In this sense, the feedback from categorisation allows Niche Construction dynamics to apply to linguistic categorisations. It was argued that this dynamic fits with the Cultural implication of an Embodied account of language comprehension. That is, this study has concluded, similarly to Kirby et al. (2007), that universal patterns across populations do not necessarily imply strong innate biases. This was done by arguing that Cultural, Embodied systems tend to drift towards better representations of the real world, which involves better coherence with perceptual and environmental constraints, creating cross-cultural patterns. Furthermore, an Embodied approach to cultural dynamics incorporating a mechanism for perceptual warping predicts that the perceptual spaces of individuals can be synchronised through language to achieve better communication. In a series of posts, I’ve been discussing constraints on the evolution of colour terms. For the full dissertation and references, go here. This section reiterates how a link between linguistic categories and perception fits into Niche Construction Theory. If concepts can influence perception, and people share the same concepts, their perceptions will become synchronised. This would render them more effective at communication, since referents would be perceived as similar (‘red’ can refer to the same domain of entities for each individual). Furthermore, it may render them more able to co-operatively build a better model of the actual environment (for instance, describing an unseen danger, or researching physics). However, this will only be true if language is grounded in constraints that come from the actual environment. If this were not the case, apart from being inefficient at describing the actual environment, a language may drift to influence the perceived environment in a way that results in a worse fit with the actual environment. Returning to the constraints diagram (above), note that the influence of categorisation continues, through action, to change the environment. In other words, if language influences the perceived environment and facilitates communication, then it may also facilitate the way we change the actual environment. In this sense, language’s influence on perception can be regarded as a form of Niche Construction (Laland, Odling-Smee & Feldman, 2000). Therefore, not only does language become better at describing the actual environment, but the environment becomes better suited to being described by language. This creates a better fit between perceived and actual environments and possibly increases the fitness of language users. Essentially, then, this study presents evidence for language-specific niche construction where language can influence the environment. This dynamic would be a consequence of an Embodied system, and more efficient as part of an Embodied system than a Symbolist account. I therefore argue that the Embodied account is supported. 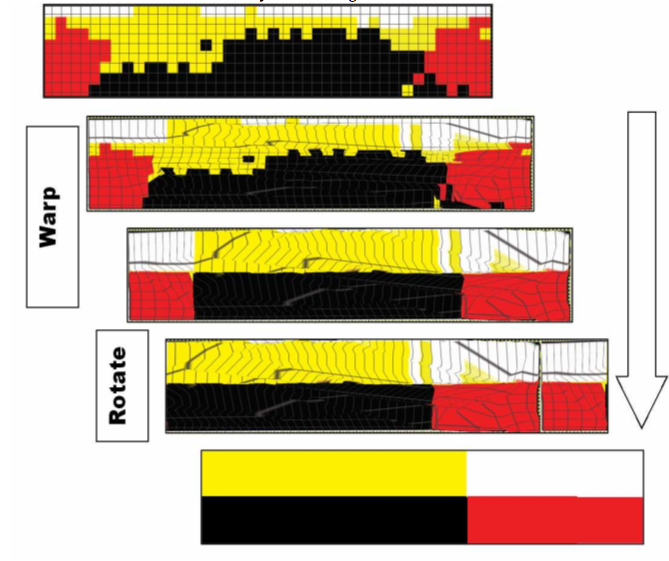 As an example of this dynamic, Hansen et al. (2006) showed that perception is affected by semantic knowledge, specifically that achromatic bananas look yellow. However, bananas are domesticated (Heslop-Harrison & Schwarzacher, 2007). The link between a banana’s structure and colour, therefore, is a constructed niche – cultivators fertilise the ‘best’ bananas, which go on to influence the way they perceive bananas, which affects which bananas they fertilise, and so on. This means that the effect found in Hansen et al. 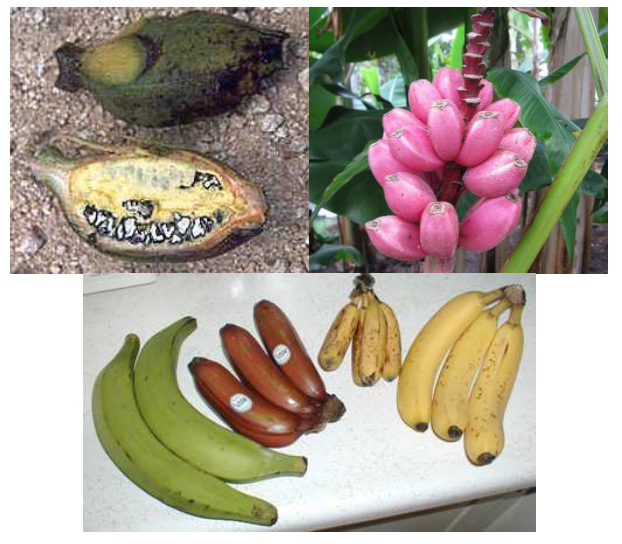 cannot be innate, since the colour and structure of a banana have changed (see below). Modulating perception with flexible, high-level categories is a way of keeping up with rapidly changing environments. Less anecdotally, Griffin’s (2006) model, which classified objects using colour (see section 5.2.2), found that natural colour categories optimally aid the identification of objects. Furthermore, the model performed equally well for natural and manufactured objects. That is, manufactured objects have been coloured to be maximally classifiable by colour, according to linguistic colour categorisations. This would be an intuitive and efficient tactic if, as Embodied Cognition suggests, comprehension is scaffolded onto systems of object recognition (MacWhinney, 1999). There would be no advantage in doing this in a Symbolist system where perceptions and concepts have arbitrary connections. In a series of posts, I’ve been discussing constraints on the evolution of colour terms. In the last post, I discussed Perceptual Warping. Here, a further adjustment to the assumptions about perceptual space is suggested. The assumption that all perceptual spaces are the same may be unrealistic and may favour Universalism (see Levinson, 2000). To begin with, colour vision and colour concepts develop during ontogeny (Bornstein, Kessen & Weiskopf, 1976, Roberson, Davidoff, Davies & Shapiro, 2004). Secondly, there may be an underestimation of the variation in colour term systems across cultures (see section 5.2.5). Going back to the example of Tzotzil, colour terms seem to be intricately related in a way that, for example, ‘blue’ and ‘green’ in English seem not to be. This prompts a third way of approaching the formation of colour categories. An individual begins with no conceptual space, but learns relationships between colour terms and perceptions. For example, learning that ‘yellow’ and ‘blue’ are as different as light with 640nm and 450nm wavelengths. By using an embodied, relational approach to colour categories, one can construct relationships between terms based on any perceivable feature. This could include brilliance, reflectance or the physical structure of the object. Therefore, a banana looks yellow because its colour is understood in terms of its structure, as well as its spectral properties. This is a more stable approach to object identification, since structures are usually stable, while colour is not. It would also fit with the grammaticalisation of colour terms to extend to other domains. For example, the Tzotzil sak-vilan, meaning ‘pastel’ originates from the fading of colours on fabric from fraying (MacKeigan & Muth, 2006). Constructing relationships between words based on the relationships between the perceptual properties of their referents would then be part of a general learning mechanism which facilitated the learning of all concepts. The last few posts have showed that several domains of constraint influence colour categorisation. There is evidence that these categorisations can influence perception, which has been identified as a crucial argument for Relativism. This section considers the Cultural implication, summarised in the last section, in greater depth. First, the idea of perceptual warping is explained and applied to colour categorisation. Next, the impact of a feedback loop caused by an Embodied approach is discussed in terms of Niche Construction. Thirdly, perceptual warping, within a system with Niche Construction dynamics is argued to lead to convergence of perceptual spaces, resulting in better communication. Finally, a note is made on compositionality in language. It is concluded that Embodied Cognition may explain some of the features of the emergence of language. This section explains perceptual warping. 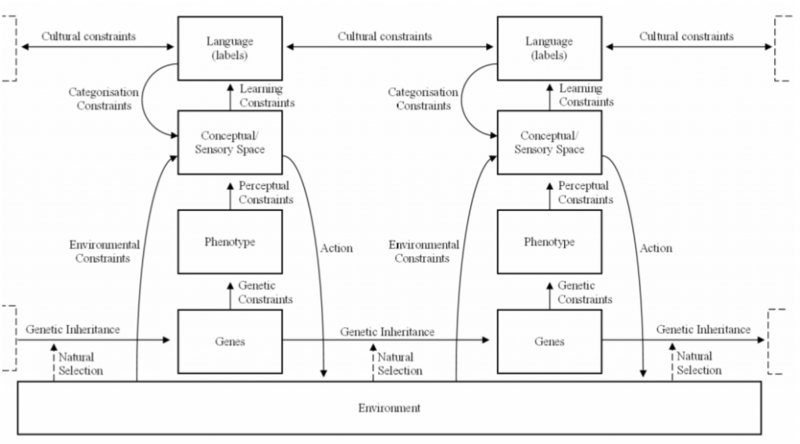 Many models of the cultural transmission of denotation systems begin by defining a perceptual space for each individual which is then divided up with loci and boundaries (e.g., deBoer, 1999). Eventually, a kind of ‘lookup table’ is produced where an individual calculates within which boundary a given stimulus falls in order to classify it. An alternate view would be that each individual alters (warps) the perceptual space to suit the categories (Goldstone, 1994; Kuhl, 1994). This is not a controversial theory for the auditory modality. For instance, although born with the ability to detect any meaningful difference in any language, children eventually become unable to detect those differences that do not exist in the languages spoken around them (Eimas, 1978, Miyawaki, 1975, Kuhl, 1983). In other words, humans do not merely categorise areas of the audible spectrum as belonging to particular phonemes, but actually alter their perceptual space to suit the phonemic system. In the visual domain, Kuhl (1994) argues that the perceptual space is permanently changed by exposure to graphemes, although Lupyan (2008) shows that categorical perception can emerge on-line. The figure above is a graphical illustration of warping a perceptual space (Colour space of Culina, from Regier, Kay & Khertarpal, 2007, p. 1439). The division of the Munsell colour space by speakers of Culina is warped and rotated to optimally encode the colour categories. Formally, the parameterisations are the same. However, warping the perceptual space allows for compression of information. For example, the initial encoding of the Figure takes up to 40 x 8 units, while the final encoding takes only 4 units . This can ease processing and storage requirements. Compression reduces the uncertainty between categories (e.g., red vs. green) and the ability for individuals to differentiate within categories (e.g., different shades of red), similar to the effects of categorical perception. This approach has already been suggested. Buchsbaum and Bloch’s (2002) study showed that the NMF algorithm approximates colour categorisation in real languages (Non-negative Matrix Factorisation – a factor analysis algorithm like PCA, except that it is designed for values that are inherently positive and cannot be centred). NMF essentially warps the perceptual space to best describe its limits. The current study suggests that language sets constraints on an NMF-like process which works to alter the perceptual space to suit culturally salient colour contrasts. However, it is suggested that this optimisation is not primarily a response to an adaptive pressure, but a consequence of the way we understand language. Indeed, it is only because our perceptions can be aligned with our language system that semantics works at all. This would fit better with an Embodied view than a Symbolist view. However, humans are able to perceive gradients in colours within categories. There are two explanations for this. Firstly, there may be two separate, competing perceptual and ‘categorical’ colour spaces, similar to Connell and Lynott’s (2009) hypothesis. Since the categorical system is shared and can quickly adapt to immediate environmental pressures, one would expect agents with two systems to increasingly rely on the categorical system, especially for communication (see code duality theory, e.g., Hoffmeyer & Emmeche, 1991). In contrast, novel tasks which involved no communication (e.g., comparing colours and choosing an ‘odd one out’) may rely more on the true perceptual system. A second explanation for the flexibility of categories is suggested by Lupyan (2008) who shows that perceptual spaces can be warped, but by context-specific, online processes rather than long-term, memory-based processes. This would allow a single conceptual/perceptual system (as Embodied Cognition hypothesises), as well as explaining the plasticity of language. Continuing my series on the Evolution of Colour terms, this post reviews evidence for categorisation constraints on colour perception. For the full dissertation and for references, go here. Continuing my series on the Evolution of Colour terms, this post reviews studies of cultural constraints on colour naming. For the full dissertation and for references, go here. Continuing my series on the Evolution of Colour terms, this post reviews how learning constrains colour naming. For the full dissertation and for references, go here. Continuing my series on the Evolution of Colour terms, this post reviews evidence for perceptual constraints on colour terms. For the full dissertation and for references, go here.